This big dog is devoted, protective of its family and eager to please, making it a great watch dog. 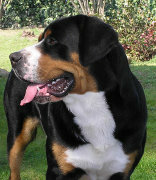 Developed in the Swiss Alps (as the name suggests), the Great Swiss Mountain dog is a descendant of the Roman Mastiff, which was brought to Switzerland more than 2000 years ago. Originally, these courageous but cautious dogs were used for guarding and herding livestock, farm sentinels and draft dogs (which led to them being nicknamed ‘the poor man’s horse’). Health wise, these rare dogs are prone to epilepsy, hip dysplasia, distichiasis. They love to eat and eat quickly, so are prone to bloat and digestive disorders. Care must be taken not to over-feed them. They need moderate exercise and are easy to groom, which, along with their sweet and easy-going nature, make them fantastic family pets. By joining this group, you club together with other Swissy owners to get a great deal on pet insurance for your gentle giant.